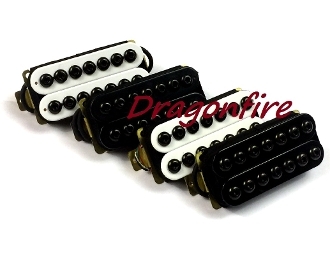 Dragonfire 7 String Crusader pickups feature oversized hex-style poles and a total of three ceramic bar magnets for a wide effect magnetic field. This allows these overwound high-output humbuckers to excel in all things Rock & Metal. If you are looking for heavy tone and rock-steady performance, these are the pickups for you. Wound to an overloaded 18.1K (approximate) output on the bridge and 9.1K (approximate) on the neck, these can definitely perform and the ceramic magnets featured in these pickups provide crisp, clean, modern tone. These dynamic pickups feature hex-screw style polepieces. All 14 polepieces on each pickup are adjustable for optimal sound versatility. These are great for personalizing your playing style and taking it to the next level. As a bonus, show off your flair with the option to choose from black, chrome or gold pole colors!